Our subconscious works hard on our behalf, trying to make sense of our lives. This shadow play is slow and long, and often fraught with fear and pain. It is in this context that we are confronted with our sorrows, suffering and the secrets we keep from ourselves and from others. Ultimately, we are also confronted with our fate: karma. Here we meet up with the results of everything we have done. This further puts the focus on repressed agendas and restraint. What have we wrought with in our lives? This is a key question of the Twelfth House, and we will deal with it both consciously and unconsciously. Will the answers compel us to be transformed or reborn? This is another cornerstone of the Twelfth House - the manner in which we move forward. The last house of the zodiac also recognizes that we can feel bound in life - stuck and confined. For this reason, this house rules jails, hospitals, institutions, asylums and any space that inhibits freedom. More gloominess in the Twelfth comes in the form of danger, secret enemies and clandestine affairs. Beware! 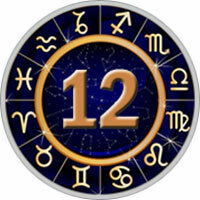 While some may decry the Twelfth House as the garbage bin of the zodiac, it’s really an unfair term. Ultimately, this house is the champion of positive transformations. It is here that we stand on the precipice and determine how we will proceed. By visiting the unconscious and meeting with the past, we begin to glean what the future will bring. This house is where we lock up our secrets, and repress aspects of the Self. Sometimes that emerges in relationships, when we’re drawn to those that act out our demons for us, giving life to something that is trapped within. In drama, the villain plays an aspect of ourselves we dare not claim, but lies as a potential in the vast landscape of the imagination. Over time, the shadows of the twelfth house are recognized and accepted, and even seen as a catalyst for building character and learning to walk through the dark. The Twelfth House is ruled by Pisces and the planets Jupiter and Neptune.